In the over ten years I’ve lived in San Diego, I know how good we have it. It pretty much never rains, the temperature coasts comfortably at around 70 degrees for most days of the year. And, let’s not forget the number of beaches that we’re blessed with, alongside with the beautiful hiking trails, the historical Gaslamp, and the close by wine vineyards in Temecula. Yup, we have it pretty good. But in the over ten years I’ve lived in San Diego, it’s easy to take it for granted. So when my friend propositioned that we go on a hot air balloon ride in Del Mar, I thought to myself, “Seriously, what more is there to see? I already know what I am going to see down there.” And yet, I reluctantly agreed. I didn’t want her to go alone. And off we went, on a perfect spring-esque afternoon. We had signed up for the sunset hot air balloon adventure, which takes you over the scenic coast of Del Mar, and lands, finishing off the evening with wine, cheese, and crackers. We are to meet the hot air balloon team at a designated area, and from there, a small group of us board a van, which drives up atop a hill where rows of deflated balloons lined next to each other, ready to be filled up and cast away into the sky. We are not the only group there. There are many little groups, and one by one we take turns, watching each group pile into their balloon and float up towards the fluffy white clouds. It’s about as dreamy as it sounds — and it was perhaps at this moment, as we waited for our balloon to be filled up, as the enormous flames fired up beneath the balloon, I began to grasp the magnitude of the experience we were about to embark on. These balloons are HUGE. And we are about to go with one of them, into the SKY. Finally it comes to our turn. Our pilot instructs on how to stand (yes, there exists a way to stand in a hot air balloon) – holding on, bending knees, a countdown, and then the pilot turns on the fire, and off we go! All of us are a little bit terrified – aside from the balloon pilot who has probably done it a thousand times, the rest of us need to have a little bit of faith. You realize: the only thing that’s holding us up here is a balloon filled with hot air. And then, there’s the idea that there are a bunch of people, standing in a basket. Hovering in the air. It’s hilarious and horrifying all at the same time. But once you’re up there, high up, all of these anxieties fade into the background. And what surfaces is the breathtaking view of the earth below you, and one of the more startling aspects of this is the realization of how silent it is up in the sky. No cars or beeping of machines, no chatter nor music. Just the sound of the fire lighting up the balloon ever so often. The experience is profound. Below, the city scintillates. Cars rush through the labyrinthine highway systems, and windows sparkle to the reflection of the sunset as we pass by. We pass over the many Del Mar golf courses – the pristinely green grass covers the earth like a warm felt blanket. We learn of the various celebrities that live in the area – Bill Gates, apparently. Jenny Craig. A smattering of football players from the Chargers. We pass through patches of farm land, even, and kids playing at a nearby park shout and wave as we pass by. It was in this experience I was reminded of how beautiful San Diego was. It’s a different perspective, literally and figuratively. From the sky, there many moving parts below, but everything is meticulously connected, interwoven, beautiful. It is a humbling experience. 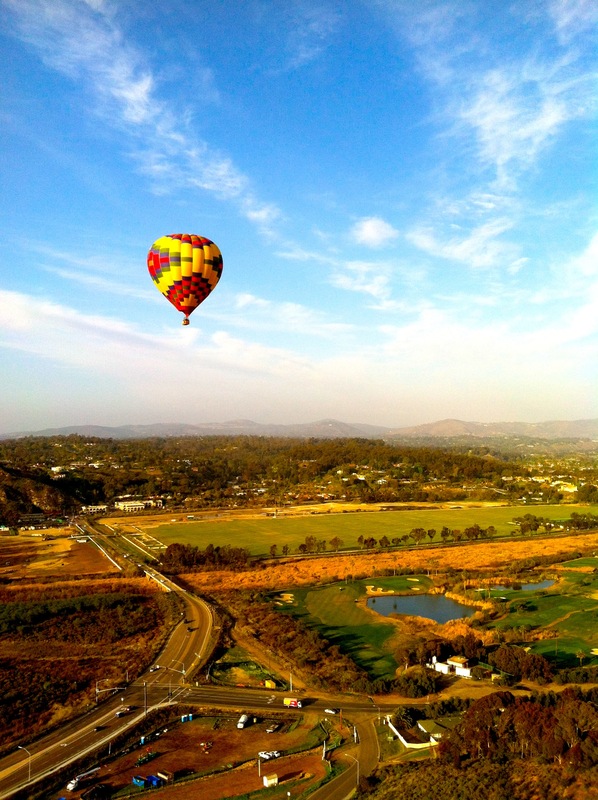 This entry was posted in Do, Explore, San Diego, Stuff we love and tagged appreciation, do, explore, hot air balloon, scenic, thrive. I love the first photo- it’s incredible to see how huge the balloons are. Beautiful view in the second picture too. I have always wanted to go on one and now this post is making me itch to do it! What a treat, thank for sharing! Beautiful imagery and a lovely sentiment. A great reminder of how powerful a a shift in perspective can be. How fun!!! I need to do this! 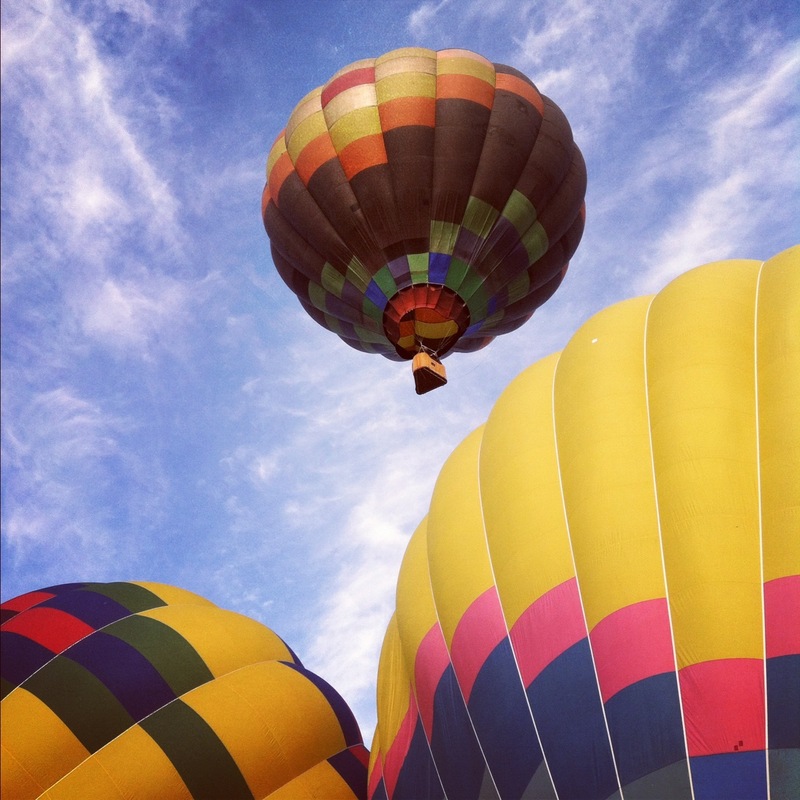 One of the things on my bucket list is to visit New Mexico for their hot air balloon festival.